Based at 22 Carmyle Avenue, Foxley, Glasgow, Heritage Engineering is the trading name of the Industrial Heritage Co. Ltd. 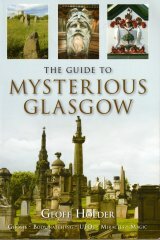 They specialize in restoring and reproducing ornamental wrought and cast iron castings, particularly the public drinking fountains, bandstands and architectural features from the trade catalogues and pattern books of Walter Macfarlane & Co 's Saracen Foundry and other 'Artistic' foundries in and around Glasgow, such as the Lion, Sun and Elmbank foundries. In recent years the firm has restored the Macfarlane fountain at Bardowie Road, Possilpark, and copied this for a park in Cardiff (2003), as well as constructing a copy of the foundry's ' Bailie James Martin Memorial Drinking Fountain, for the set of the BBC Scotland series, River City. They restored the Bailie James Martin Fountain itself in 2007. 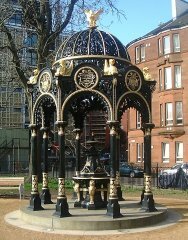 They have also restored the Lion Foundry's Hudson Fountain in Peel Park, Kirkintilloch, and a large-scale fountain in Dun Loaghaire, Eire, by George Smith's Sun Foundry. As well as restoring ornamental castings, the firm houses a important library and archive on Scottish ironwork, including a major collection of the foundries' pattern books, which provide the essential illustrations and dimensions necessary for their accurate restoration. Together with this, their ground-breaking research in the field and their photographic collection of surviving and restored structures, constitutes a major contribution to the documentation and study of one of Scotland's greatest and largely forgotten industries. The team at glasgowsculpture.com is grateful to Jim Fleming and Heritage Engineering for allowing us access to their archives, and for the permission to use images from their collection of foundry pattern books and catalogues.